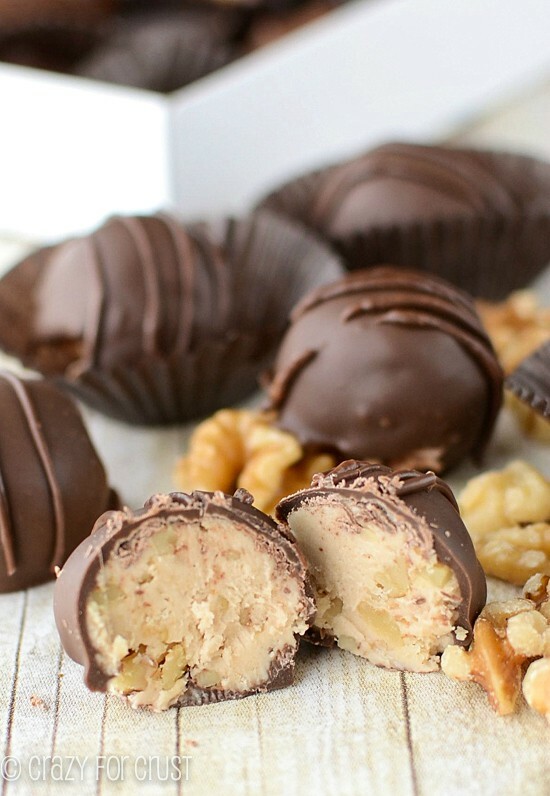 These Maple Walnut Truffles have a whole lot of maple and walnut flavor, with the perfect amount of sweetness! How many of you have heard of See’s Candy? If you live East of Chicago, you probably have no idea what I’m talking about, but if you have ever lived on the West Coast, or been to an airport in the West, you’ll probably recognize the name. See’s Candy is an iconic candy store here in California. I grew up on the stuff. The plant where it’s made is actually in South San Francisco, just minutes from my childhood home. The plant where they make the (totally nut-free) suckers is actually in Burlingame, my home town. On a good wind day you can smell the chocolate from the factory near my hold house. It’s like watching Willy Wonka, only better. Walking into a See’s store is like smelling home to me. No matter where I am, whenever I walk into the shop with the black-and-white checkered floor, I take a deep breath and I’m instantly transported to my childhood. Several of their candies have been on my copycat bucket list for a very long time. (Butterscotch Squares, I’m looking at you!) I decided to start with one of my absolute favorites: the iconic (and See’s original) Maple Walnut Truffle. If you follow me on Instagram, you may have seen my See’s Candy photo bombing last week. As part of the Sacramento Bloggers group, I was invited to a pre-grand opening tour of the newest See’s store in Folsom. 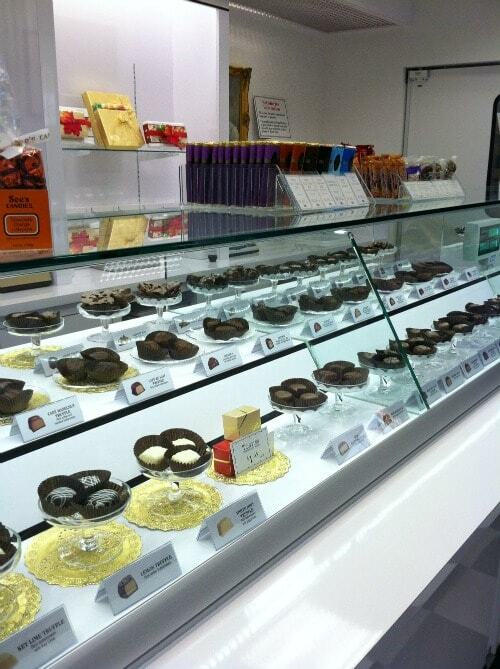 A bunch of us bloggers, quite literally, got to go crazy in a candy store. I even got to go behind the counter. It was like a dream come true! Of course, my trip to See’s was super inspiring. I came away with about 25 different things I want to copycat. And even though I also came home with several pounds of candy, I decided to make some. Never enough sugar around yo’! 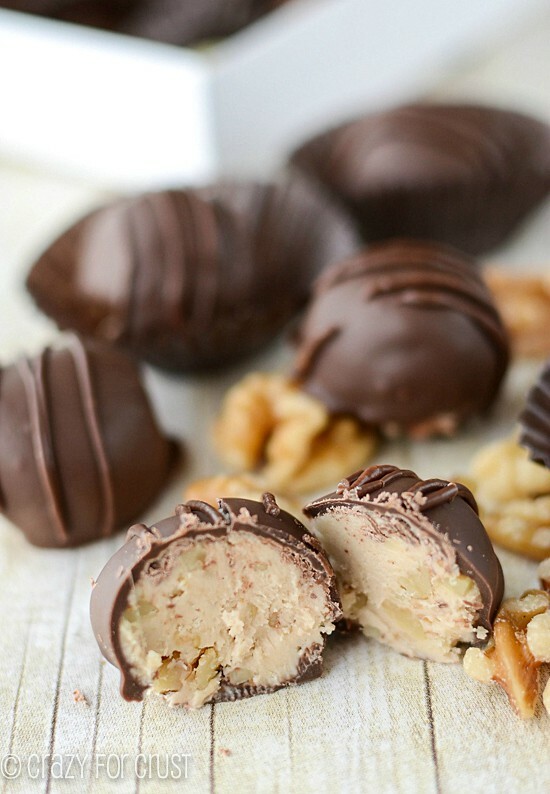 I’ve always loved these Maple Walnut Truffles. When I was a kid, a 1-lb box of See’s lasted less than 24 hours in our house (and there were only three of us, my mom, dad, and me!) By the morning after, the box would be but an echo of brown wrappers, half pieces of fruit filled candy no one wanted, and the knife used to cut them. 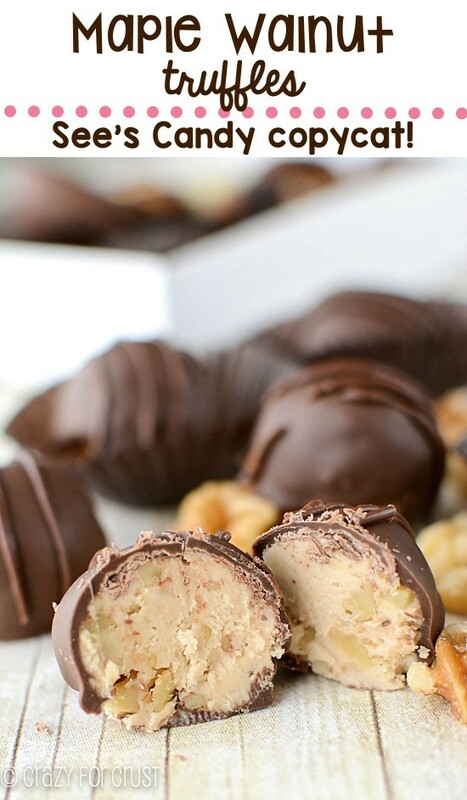 I never needed to cut the Maple Walnut Truffles in half. I could identify them on site. Not perfectly spherical, they were higher than they were round. Unfortunately, we all know that my truffles are lucky if they are spheres. Heck, they’re lucky if they don’t look like brains, so I wasn’t going to get the telltale See’s shape. I went for perfect round balls of delicious. The maple filling is a maple buttercream, made with butter, powdered sugar, and flavoring. 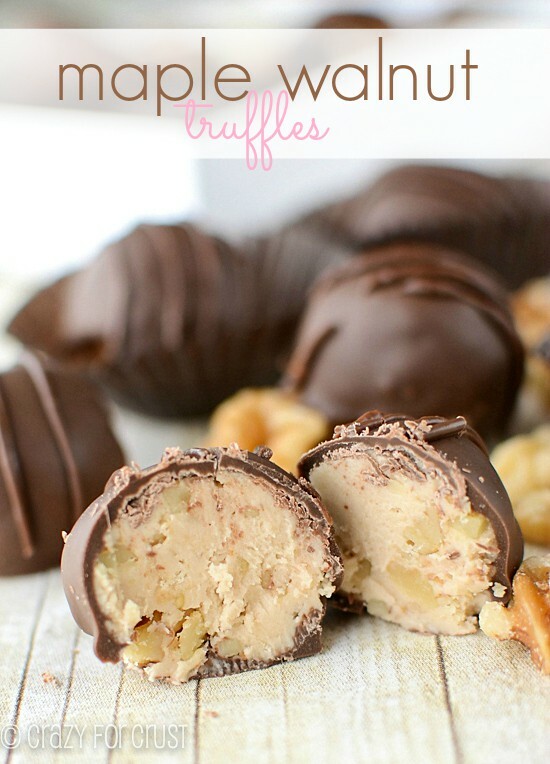 You mix in some toasted walnuts and then dip the truffles in chocolate. These may not look like the original, but they sure do taste like them. I’m a little scared that I know how to make these now. And that I always have the ingredients to make them on-hand. Sugar highs, every day, for sure. I just wish I could replicate the chocolate-in-the-air smell. Now that would be cool! 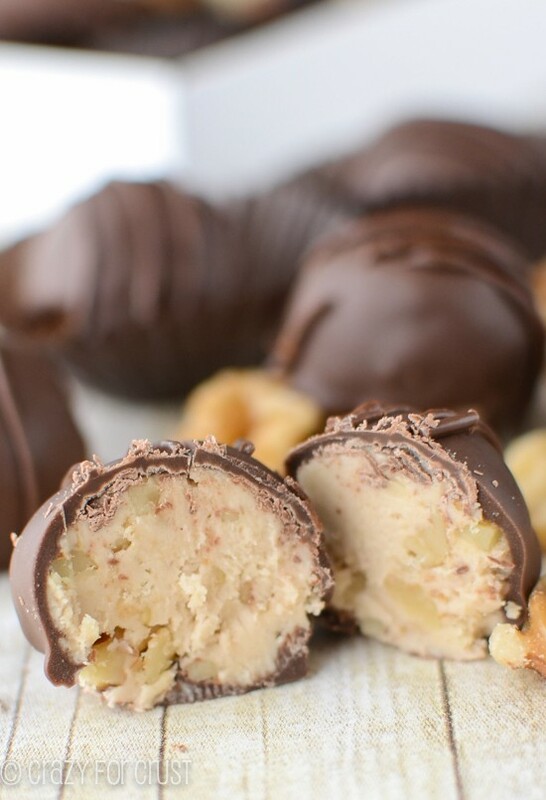 These Maple Walnut Truffles are a See's Candy Copycat! Just like the original, but made at home! Mix butter, maple syrup, and powdered sugar with a hand mixer. Add both extracts and beat until creamy. Stir in walnuts. Chill for 30 minutes. Once chilled, scoop 1 tablespoon sized balls of dough and place on a wax paper lined cookie sheet. Chill again until just ready to dip (at least 10 minutes). Melt your candy in a microwave safe bowl according to package directions. 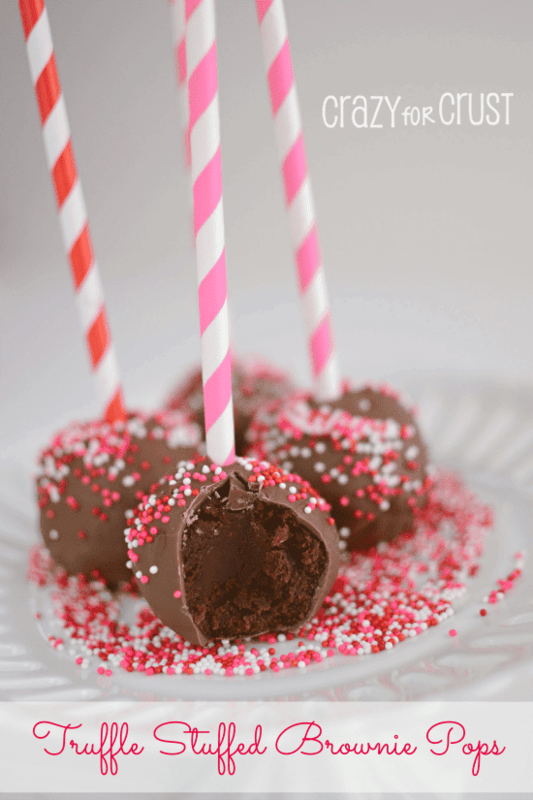 Dip each truffle in the bowl of chocolate. Do not roll it around, use a spoon to spoon chocolate over the top. Lift onto a fork carefully and tap to remove excess chocolate. Place on a wax-paper lined cookie sheet. I find it best to use a toothpick to help the truffle slide off the fork without disturbing too much of the coating. 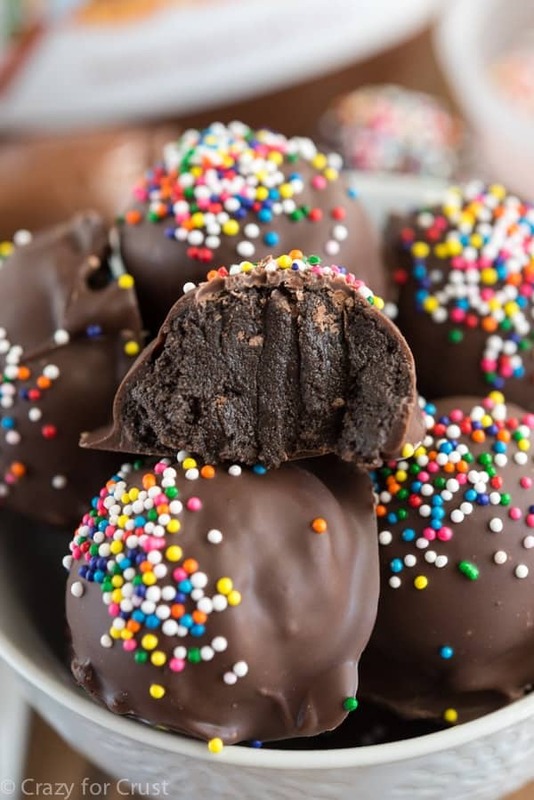 Note: these truffles soften quickly. If you find them getting to soft, re-chill them and only remove a few at a time to dip. Chill dipped truffles for just a few minutes, until coating is semi-hard. Meanwhile transfer the remaining chocolate to a squeeze bottle (or a plastic bag with the tip cut off) and pipe swirls or swipes of chocolate over the top for decoration. about how many does the recipe for Maple Walnut Truffles make? I doubled the recipe and got 38 so I’d estimate 20. Oh.My.Word! I pinned this recipe a while ago but just got around to making it. It’s a good thing most of them were a thank you gift or I would be in trouble. I doubled the recipe and used Ghirardelli dark chocolate melts. Definitely won’t be the last time I make them. HELP my sister wants Sees Mincemeat Candy and they do have have them listed this year and several years not even by mail order. I have tried making something with mincemeat and dipping into Graters Dark Choc but yeuch. I can get Graters (Cinci) dark chunks or have in the past but my sister WANTS sees. Like Skyline Chili that LA transplants freaks wanted. OR a CANE sugar recipe as Sanders uses corn syrup like Vernors now and I can taste it, but am willing to do Sanders Dark if that works better. Love, love See’s, the best chocolate, period. I was hoping you would have the nutrient values like how many grams of sugar, how many carbs. Can’t wait to try these. I used pecans as I didn’t have any walnuts at the time, but they disappeared amazingly fast. 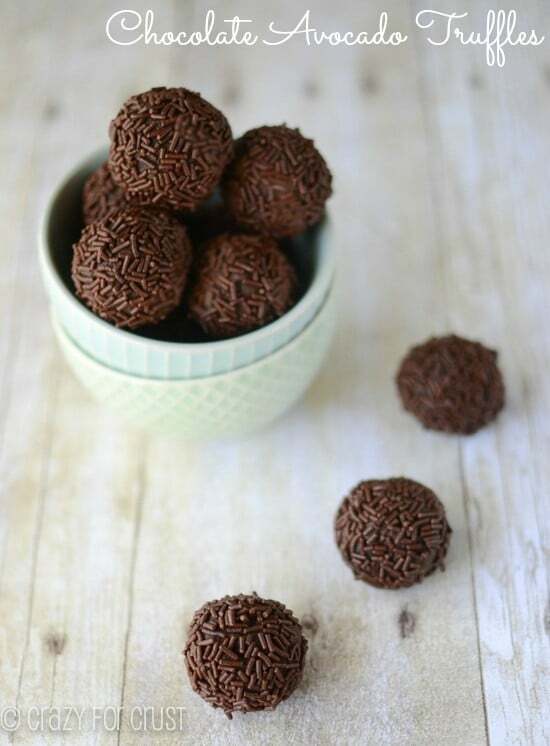 Delicious balls of heavenly pleasure. Thank you for the recipe I found on Pinterest, I shall be making these again. Did you perfect butterscotch squares?! Those are my favorite!